Legit- don’t tell me what to wear! Legit don’t want their customers to think of them as just another fashion retailer, they are your fashion friends and stylists. Bling it up: Legit stores offer a great variety of exceptional ‘bling’ accessories including necklaces, bracelets, charms, earrings, rings and more. 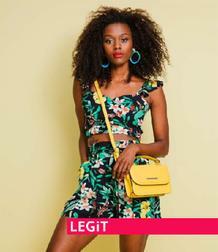 Style away: Legit showcases trending fashion on their website. Some of Legit’s trendy items to date include hats, funky scarves, bags, baggy pants, racy and lacy sneakers, jumpsuits and more. Top it off: With so many different shirts and tops to choose from, you are going to be completely spoilt for choice at Legit. Their range of tops include shirts, blouses, vests, peplums, dresses, camis and more. 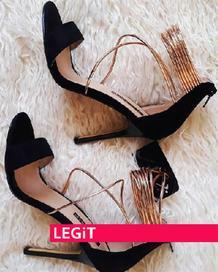 Walk the walk: Legit stores offer the most exquisite and trendy shoes to their customers including (among others) sandals, heels, flip flops, flats and sneakers. Legit regularly publish and distribute their trendy Legit magazine which showcases the latest and greatest news, event and local gossip. The magazine is filled to the brim with exciting celebrity news, interviews, latest fashions, accessories, competitions and opinion pieces. This further re-enforces Legit’s promise to their customers, that they are more than just another fashion retailer, they are your fashion friend and stylist. Legit provide quality, affordable clothing which is both trendy and stylish. They also provide regular Legit specials on selected fashions throughout the year, so keep a look out! Guzzle showcases fashions, shoes and clothing for all ages from leading retailers, including Legit specials and deals so make sure to get browsing now! You can also visit the Legit Website for the latest fashion’s and news. Address: Shop 17&18 Mooirivier Mall Cnr Nnelson Mandela & Govan Mbeki Drive Potchestroom 2531. Address: Shop 25 Greater Edendale Mall Main Road 3201. Address: Shop 91 Jabulani Mall Shopping Centre Stand 2127 Klipspruit Ext. 5 Soweto. Address: Shop 72 Maponya Mall (Ex. Soweto Triangle) Stand 2127 Klipspruit . Soweto. Address: Shop 58 Keywest Shopping Centre Cnr Paardtkraal & Viljoen Str. Keywest Cntr. Address: Shop No. 23; Cornier Michael Brink & 10th Avenue; Gezina Galleries; Gezina Pta.